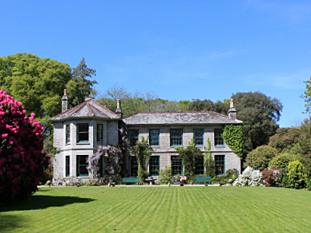 A small privately owned country estate in Cornwall, between Falmouth and Constantine, which has been in the same family since 1760. Now after more than 250 years this beautiful home and it’s gardens can be visited from March until the end of August. Please click on the links below for more information on either a visit to the garden, which after years of neglect is steadily brought back to life, or to read more about a tour of the house, which is filled with centuries of history. Bosvathick started life as a small farm hamlet on a plateau protected by a ridge from bad weather to the south west. Here were two farms each with buildings and a central yard between them. The bigger of the two houses became Bosvathick House. Although there was work done to the gardens and drives, we have few record of any changes before 1868. In 1880 it was decided to reorganise the garden and change the route of the drives. This work resulted in the defining of the present garden. 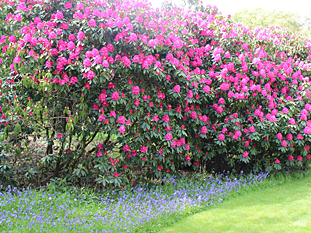 Like many other Cornish gardens, Bosvathick has magnolias, rhododendrons, azeleas and many other plant specimens, but because the family worried about wind and privacy, banks of laurel were developed to shelter the house and shrubs and plants. Fear of wind and pruning ensured the garden became completely overgrown. It is only now in this generation that the gardens are being claimed back from the overgrowth and areas are refound, re-established and old finds lovingly restored. Bosvathick’s garden is a work in progress where old shrubs are given more light and space, sometimes even a new location and masses of summer flowering perennials fill the newly created borders. In 2013 we designated a neglected field to become the new orchard and the 32 mostly southwest apple varieties should start producing in a year or two. 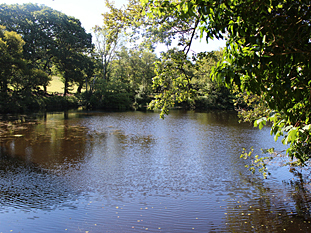 We also have cleared around our 3/4 acre lake, now visible from the drive and it is yearly visited by a pair of Canada geese who have raised their goslings successfully in three consecutive years. It is truly a garden of the past and a garden of today. Bosvathick is near the north bank of the Helford river, in the southwest of Cornwall. It is an area of outstanding natural beauty and close to many other beautiful Cornish Gardens and stunning coastline and beaches. Bosvathick is marked on the OS map. We are two miles east of Constantine, on the Falmouth Road. It has a large entrance on the northside of the road – granite gateposts with balls on top and granite lions flanking. Food and Drink – We serve teas and coffees and some children’s drinks as well as cream teas and a small selection of home made cakes and/or biscuits from our family kitchen. Accessibility – People with walking difficulties will be able to see many parts of the garden. Unfortunately for people in wheelchairs the garden is difficult to access as there are steps, uneven paths, lawns and sloping fields. Dogs – Dogs are more than welcome but will have to remain on a lead at all times throughout the garden and in the fields. There are toilet facilities for garden visitors but currently we do not have a changing area for babies. Also there are presently no facilities for disabled guests. The Garden will be open every Wednesday and Thursday from 30th March until the end of August. Price: £4.00 Per Person, children under 12 free, dogs on leads welcome.